Kung Fury: Why the Horror genre should take notice. If you haven’t heard about Kung Fury yet, I seriously question what you do on the internet. 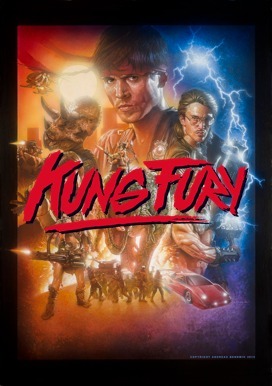 The brainchild of David Sandberg (Writer/Director/Star/Visual Effects Ninja), and his Laser Unicorns Production company, Kung Fury is 30 minutes of highly stylized 80’s inspired rad-ness. Inspired directly by Sandberg’s love of 80’s Action films, this short pushes all the right buttons and is the kind of throwback that many have tried to achieve but have fallen on their face while trying. I can’t go any further without acknowledging that this film is not a Horror film by any stretch of the imagination, but it remains worth discussing all the same. Not only does this film pack enough violence and bloodshed, as well as over the top awesomeness to satisfy any fan of Cheesy 80’s horror films, but the approach and overall execution of the project should serve as both an inspiration, as well as a throwing down of the gauntlet to those who wish to make throwback cinema. So what if it’s not Horror? It’s still awesome in all the ways we love and well worth a view, so without and further delay, I present: KUNG FURY!